The script that we will see today is an updated version of an older post that was used to set groups custom attributes based on which Organizational Unit is under. The reason of the creation of such script was to ensure that delegation of permissions on Exchange Online will work without any issue. Delegation on Exchange Online has been provided on local It administrators using some filters. Part of that filter is to use CustomAttribute4 of distribution and security groups in order to provide administration access to them. If the value is not correct then they are not able to administer those objects. When there was a change on Organizational Units in Active Directory I had to check all the respective arrays that is correct. There is a possibility to miss an Organizational Unit. If you miss one then the custom attribute will not be set and local IT will not be able to administer the groups below that Organizational Unit. In the previous version, I was using multiple elseif in order to check the current value of the custom attribute and change it accordingly. This resulted in to have a lot of code, that a big part of it was duplicate. In this version I have replaced it with a switch statement. The code is less and clearer to read. Previously there was use of backtick to present the code in a more readable way. Now, bakcticking has been removed and I have used the splatting and normal command line continuation where is applicable. In order to make overcome the above issue that I had, I have made changes on my script, so the arrays will be dynamic, and if there is any addition in Organizational Units, I will not need to edit my script. It runs faster than before, it is smaller and easier to read. If you have any questions or anything else please let me know in the comments below. based on their Organizational Unit in Active Directory. of the group to the desired one based on Organizational Unit and the responsible IT. be sent if there are any errors duing run. 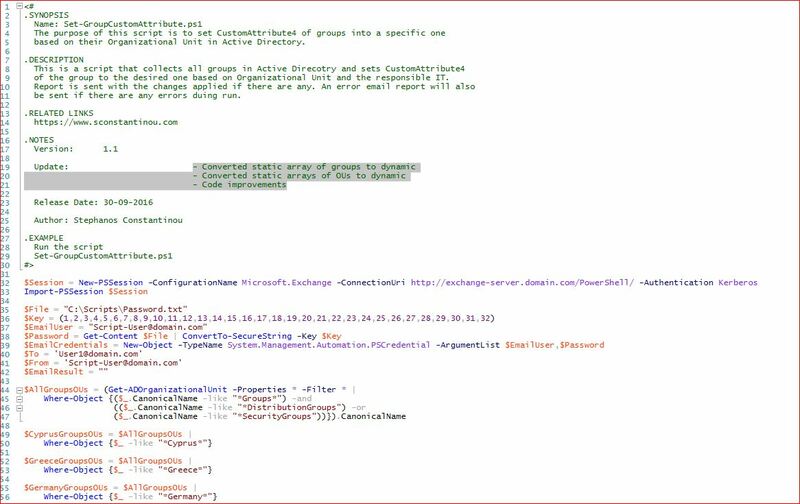 Subject = "Distribution Groups CustomAttribute4 Report $(Get-Date -format dd/MM/yyyy)"
Subject = "Distribution Groups CustomAttribute4 Report $(Get-Date -format dd/MM/yyyy) - WARNING"
PowerShell Set Groups Custom Attributes. Here you can find a script to set custom attributes on groups automatically with PowerShell.